Prisoners who smoke are to be offered free vaping kits as Scotland's jails prepare to go tobacco-free this autumn. For two months they will be free. They will then be sold at a discounted rate until April, after which prisoners will have to pay the normal price for e-cigarette equipment. More than 70% of Scotland's prison inmates are believed to smoke, a much higher rate than the general population. Among female inmates, the figure could be as high as 95%. Smoking in enclosed public places was banned in Scotland in 2006, but it did not apply to prisons. Until now inmates have been permitted to smoke in their cells and some outside spaces. 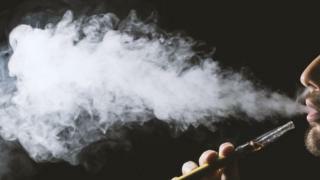 Last summer the Scottish Prison Service (SPS) announced plans to make prisons completely smoke-free, as a major study on tobacco use in prisons revealed high levels of exposure to second-hand smoke. SPS spokesman Tom Fox said it was important to help inmates give up tobacco. "People in the community who are giving up cigarettes, still have the opportunity to smoke in parts of the community. "The people in our care won't be able to smoke at all. "We are recognising the unique nature of that environment by providing the support we are." Concerns have been voiced that the smoking ban could lead to unrest, but similar bans have already been introduced in many parts of England. The Scottish Conservative justice spokesman Liam Kerr said it was right to offer some transitional help for inmates, but the cost should also be considered. He said: "This is a cost to the public purse at the end of the day, but they have time limited it. "I think that has to be the right thing to do. To say we will help you transition off smoking, but after that the public shouldn't be shelling out to help you transition away."